The Piattis are amongst the UK’s foremost young string quartets, with a host of awards and critically-acclaimed recordings to their name. They have performed in all the major venues around the country, including a live BBC Radio 3 broadcast from the Wigmore Hall. The Piatti are winners of the St Martin in the Fields Competition, a Martin Musical Fund/Philharmonia Scholarship, multiple Hattori Foundation awards, and the St.Peter’s Prize. 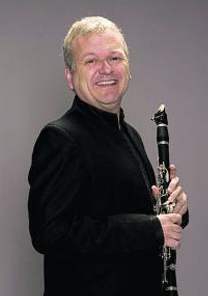 Michael Collins is one of the foremost clarinettists in the world today. Con Brio is delighted to have him back!